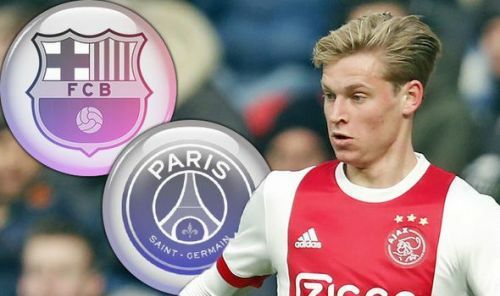 Frenkie De Jong, the Ajax midfield prodigy, who is being chased by the likes of - Juventus, Barcelona, Manchester City, might be heading to Ligue 1 with Paris St. Germain after all, according to reports. Earlier reports had suggested that Barcelona were the front-runners in securing the services of the 21-Year-Old Dutch international, but PSG have now stepped up their pursuit of the midfielder, who'll cost them anywhere near €75 million. De Jong is an academy product of the famed Ajax Academy, that had given the world some of the finest players of their generation like - Cruyff, Seedorf, Kluivert, Bergkamp, De Boer and more recently the Tottenham duo of Eriksen and Alderweireld. The player had committed to stay at his club at least until the season finishes, but a move away from the Dutch capital seems imminent once the curtains are drawn on the current season. De Jong is one of the hottest prospects in Europe at the moment. He was courted by some of the biggest clubs in the world since last summer and the Camp Nou was tipped to be his future destination for a long time. But, according to the report, PSG had sent a special delegation to Amsterdam specifically for the purpose of meeting with the player's representatives at the Amstel Hotel last Friday, while the player himself had a telephonic conversation with coach Thomas Tuchel earlier. Director of football affairs at Ajax Marc Overmars has made it clear that he wants €75 million for his 21-year-old playmaker. Only a few clubs have the ability to spent that kind of cash, with PSG being one of them. Valentijn Driessen and Mike Verweij are both reputable and reliable sources when it comes to news related to Ajax, also De Telegraaf is known for its accurate exclusives. Barcelona are not ready to give up on their target just yet and have sent their own delegation, which includes Club president Josep Maria Bartomeu to the Dutch capital according to another report. Though it seems PSG have secured their man, only time will tell where this talented player will be playing next. LaLiga 2018-19: How will things shape up if Barcelona get Adrien Rabiot too?